Creating API client credentials allows you to connect with the Unity API system using a secure, authenticated connection between SecureAnywhere and your managed systems. This, in turn, allows you to automate billing, reporting, deployment, and other processes. 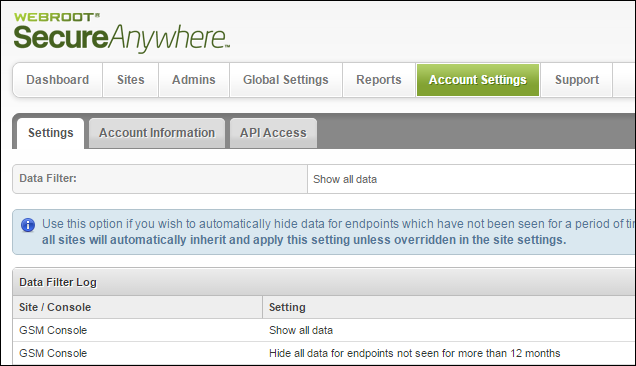 For more information on API, see Webroot Unity API. The GSM console displays, with the Sites tab active. The Account Settings tab displays with the Settings tab active. Click the API Access tab. 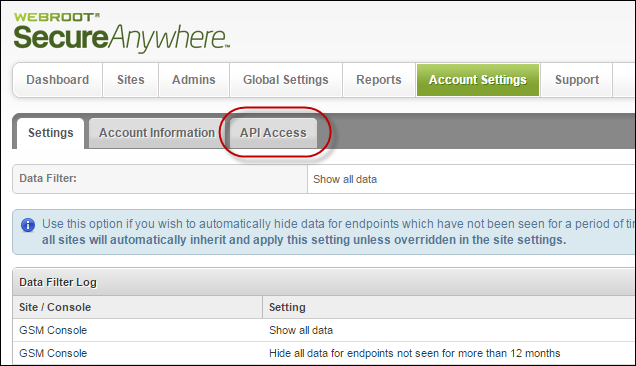 The API access tab displays. The Create New Client Credential window displays. In the Name field, enter the name of the credential. In the Description field, enter a short description of the credential. 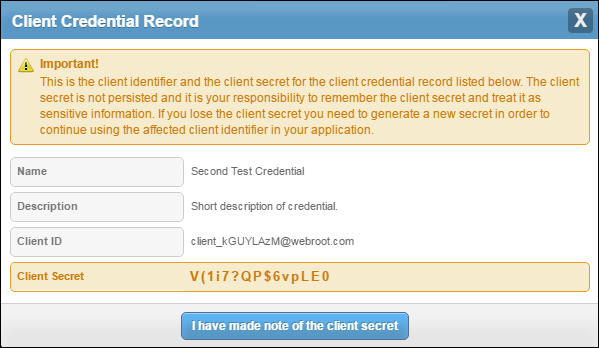 The system displays the Client Credential Record window. This window displays the name and description of the credential, reflecting what you entered, but also the Client ID, which displays in the Client ID column. More importantly, the window displays the client secret, which is not displayed in the console. You must make note of the client secret, after which, click the I have made note of the client secret button. To edit a client credential, click the Edit button, and update the fields. When you're done, click the Save Changes button. To delete a client credential, click the Delete button. Confirm the deletion by clicking the Delete button. To create a new client secret, click the Renew Secret button, and take note of the new client secret before clicking the I have made note of the client secret button. To suspend a client, click the Suspend button. Confirm the suspension by clicking the Suspend button.